Members of the Exiles after a race at RAF Deversoir. Ken Lowson is second from the right. In the picture - extreme left, Terry Wesley, chap stroking his neck is Ginger Ayres of Abyad, chap next to him stroking his chin is Ron Walsh of Deversoir and the one in white shirt and white socks is Norman Stone of the Satire CC - REME at Fayid. The gharri in the background is one of several which brought chaps from as far afield as Abu Sueir and Tel El Kebir....Thanks to John Basell for this write up. March 2nd 2011..John Basell submitted the above picture and the one below which were also taken of the same event. This picture shows more of the PSI Gharries that would have brought the chaps from other stations. It`s taken a bit later than the first photo because the riders are already being started. You can see that people are looking across the road to the start point. Henry Mainwaring (5355 Sqn) is sitting down in the foreground. I am standing up hitching up my shorts. 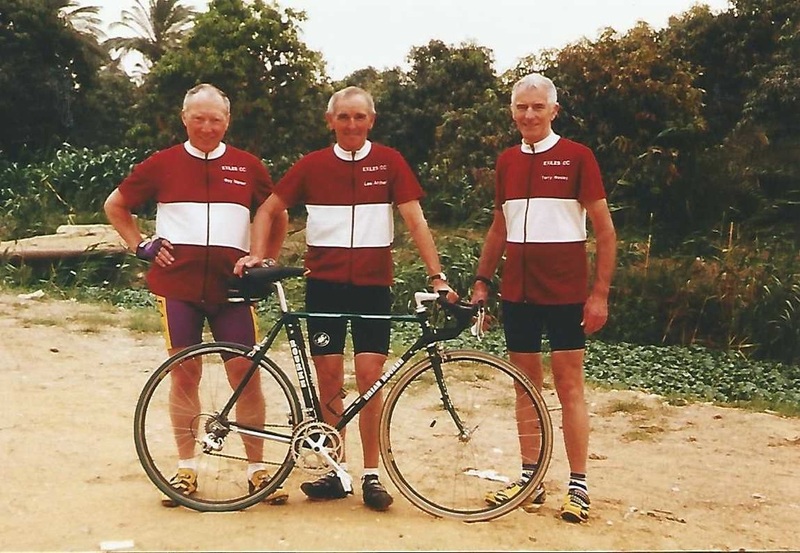 Pete Curtis (3 Tech Wing) is the chap astride his bike on the right of the picture. ( Peter didn`t have an Exiles jersey). Peter Curtis again but this time being held up on the other side of the road (by the lido/sailing club) waiting for the " 5 4 3 2 1 Off " to be called by the timekeeper who is sitting in the crowd by the kilostone in the other group picture. By that time I was already several miles up the road having been pushed off at No 19, Peter was off at No 43. 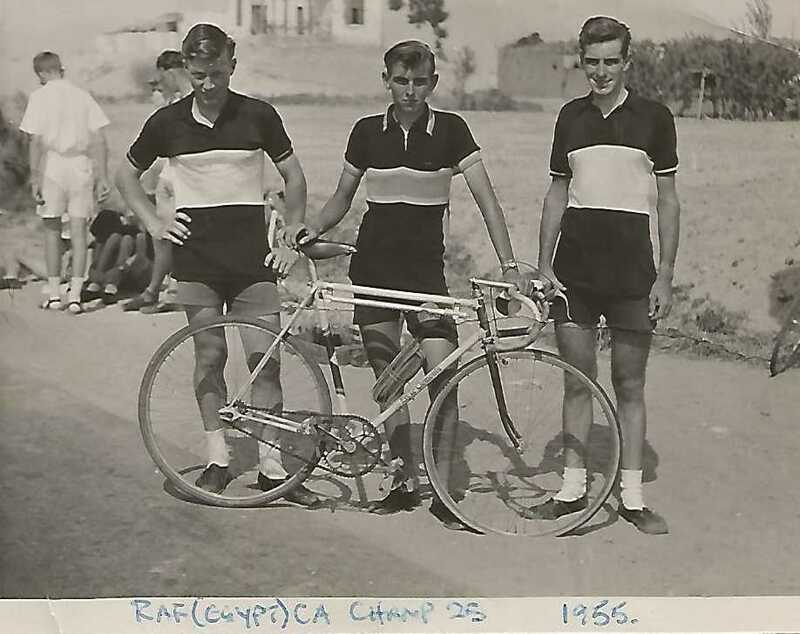 Check out near the bottom of Alan Kennedy`s Page for his write up of a week-end in Jerusalem in 1947 taking part in the Israeli Seven Sisters Hill Climb at Qastal near Jerusalem.